Doubts surrounded both the conduct and the outcome of the first public consultation meeting on the Mong Ton Dam in Taunggyi yesterday. 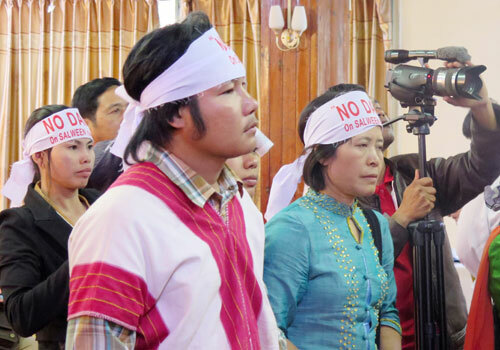 Participants suggested that in canvassing local opinion, the Snowy Mountain Engineering Corporation (SMEC), an Australian consulting firm that chaired the consultation, might have breached the law banning unlawful association with ethnic armed groups. It also emerged that many of the participants were ethnic group members whose shaky grasp of the Myanmar language meant they could not understand everything discussed at the consultation. A group of civil society organisations took the floor as the meeting wound up to express their opposition to the project. The dam project, located on the Thanlwin River, is expected to take 14 years to complete. It will produce an estimated 7000 megawatts, of which 90 percent will go to China and Thailand, with 10pc reserved for domestic use. The dam is being developed by China Three Gorges Corporation, China Southern Power Grid and Power Construction of China, as well as the Electricity Generating Authority of Thailand and Myanmar’s International Group of Entrepreneurs (IGE). The dam is the largest of six Myanmar has announced plans to build on the 2800-kilometre (1730-mile) Than-lwin, which is also known as the Nu or Salween River. During the second part of the four-hour meeting, which was devoted to questions and answers, a participant drew applause when asking how SMEC could have conducted credible social and environmental assessments in the area without committing “unlawful association” under the law, which imposes a blanket ban on contacts with armed groups. Resettlement specialist Mary Ann Botengan told the meeting, which was held in the Taunggyi Hotel, Taunggyi, Shan State, that SMEC met “different armed groups and we may seek their help in conducting practical feasibility studies”. U Kyi Win, a senior government liaison officer with SMEC, said he did not believe this contact violated the Unlawful Association Act. “We’re doing good things for society,” he said. An environmental expert affiliated to SMEC, U Ba Than, told the meeting that SMEC’s role was merely to conduct feasibility surveys, and not to favour one side or the other. SMEC is due to submit its report in the third quarter of the year, and says it will conduct 16 consultation meetings in all. Interviewed by The Myanmar Times during a break in the meeting, some ethnic Pa-O participants confessed that they had not entirely understood SMEC’s presentation. “To be honest, I didn’t get all the technical terms,” said U Yin Yin Maung, a Pa-O from Hsi Hseng township. Others said they had followed the PowerPoint presentation despite not speaking Myanmar. SMEC group leader Michael Holics said they would consider the issue in future. “We know that there will be a language barrier, and we need to make better communication at the next public consultation,” he said. According to SMEC’s presentation, the dam project will affect about 12,000 residents in Shan State. Immediately after the meeting, opponents criticised the project. “We will continue to oppose the dam. We can’t let it happen because we want the Thanlwin to be a virgin river. We don’t want a dam on it,” said Daw Sao Haymar Thaike. An official from IGE, who asked not to be named, said the company was not against the public expressing its opinion on the dam. “But obviously we don’t feel good when we see [the protest],” he said.